Australia needs to look at its landscapes in new ways if it is to meet the 21st Century challenges associated with climate change and food, water and energy security. 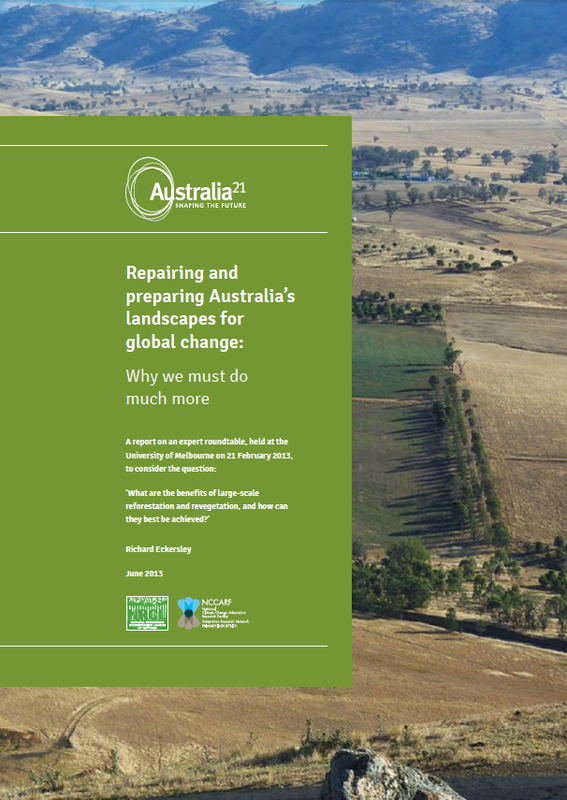 The report is based on an expert roundtable held at the University of Melbourne on 21 February 2013 to discuss the benefits of large-scale reforestation and revegetation, and how they could best be achieved. The project was co-sponsored by the Natural Resources Conservation League of Victoria and the Primary Industries Adaptation Research Network. Funding was also provided through a bequest from Jan Lee Martin. Stimulate the growth of a landscape regeneration and management industry to produce the capacity to use available funding and meet policy objectives. Richard Eckersley also said: 'The continuing failure to close the gap between what we are doing in landscape management and what we know we need to do means we are squandering our natural heritage and betraying future generations. The reasons for the lack of progress are not, now, primarily to do with poor policy or lack of public funding. They include cultural features such as the divide between urban and rural Australians and our growing disconnection from nature and all it provides for us. The state of our landscapes is not among the issues and concerns that dominate public and political debate; it should be. The benefits of large-scale landscape regeneration, reforestation and revegetation include: preserving biodiversity; reducing soil and water loss and degradation; providing shelter, shade and fodder; cooler regional climates; carbon sequestration; increasing soil fertility and productivity; more sustainable agriculture; more timber and other tree products; better pollination; production of biofuels; enhanced food, water and energy security; benefits to tourism; supporting rural communities; creating employment; bridging the cultural divide between city and country; promoting national reconciliation; improving people’s wellbeing; and higher civic morale. If you simply want to keep in touch like us on Facebook. Contact us at office@australia21.org.au for more information.